Chuan Xin Lian is a trusted and popular Chinese herbal supplement that provides support for the proper function of your stomach, sinuses, bowels, respiratory and immune systems. 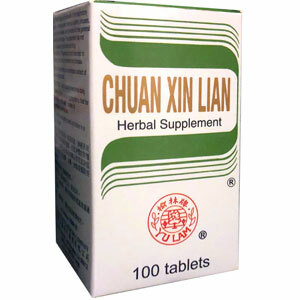 Chuan Xin Lian is a trusted and popular Chinese herbal supplement that provides support for the proper function of your stomach, sinuses, bowels, respiratory and immune systems. This is a very popular supplement in China because it contains natural herbs that provide support for the immune system. The primary herb in this popular product is Andrographis Aerial Parts Extract. Clear heat and reduce inflammation in the Upper, Middle and Lower Warmers, clear Damp Heat in the Lower Warmer. Common cold, flu, cough, chronic asthma associated with Lung Heat, yellow sputum, pulmonary abscess, pneumonia, tuberculosis and other infections associated with Lung Heat, urinary tract infection, diarrhea or dysentery. Preventative for urinary tract infection when traveling. Not for long term use or for use in excess of recommended serving size. Take 3 tablets, 3 times a day.